Our first time on Celebrity Reflection. We have been on Celebrity Eclipse (2013) Celebrity Equinox (2014, 2017 & 2018 with Captain Kate) Celebrity Summit (2016 with Captain Kate) Celebrity Silhouette (2017 & 2018) Embarkation in the new Ft. Lauderdale terminal - a total disaster. Arrived at 9:30 AM. Up escalator at 10 AM. In the first group of 50 passengers. Had our Sea pass by 10:25 AM. Computer glitch (something about Sea pass photos not loading properly) On past Celebrity cruises we were usually onboard by 11 - 11:30 AM. In the past when you received your Sea pass, we would get a number and groups would be called by those #&apos;s. Not this time - they called by cabin class: Suites, Aqua etc. We waited & waited. At 12 noon still computer issues. We did not board until 2 PM. No water, juice or snack provided. Not good for older passengers or anyone with diabetes. Very poorly handled by Celebrity. Our 21 day back to back (B2B) cruise was great. Moses was our cabin steward - best we have ever had. We always get an oceanview cabin. Loved to start our day at Cafe al Bacio with a great cup of coffee. Opus dining room & OV buffet had varied menus. Entertainment was good, not as loud as in the past. Watched the Superbowl in main theater with wings, sliders & hot dogs. 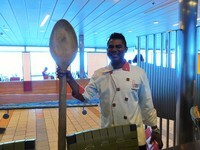 The best part of our cruise is always the staff! We even had an opportunity to talk for a few minutes with the Captain. If I had to list all of our favorite staff - it would be several paragraphs long. Did have an issue with CLA activities. Trivia games were won by a team of passengers doing a B2B, B2B, B2B (63 night total) - a bit unfair! The Sudoku challenges were so tough that twice no one finished in the given time limit. On past Celebrity cruises, you won tickets that could be redeemed for Celebrity bling (T shirts, cards, coffee mugs, beach towels, lanyard etc.) This time, often you were given a Celebrity X metal instead. I gave them back. 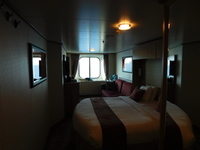 One last note: we found out several cruises ago that the cabin stewards have 17 cabin to clean twice a day with no assistant. I don&apos;t know about you - but we don&apos;t change our towels and sheets every day. So, we would several times a week give Moses our cabin steward a morning or evening off. We still gave the standard gratuities & also a bonus for a job well done. I wish more passengers would consider doing that also! For disembarkation we did the self walk - off (carry all of your luggage off by yourself) we were off the ship by 7:15 AM and through security, grabbed a taxi to our Hampton hotel in Plantation, FL and were back in our car by 8:30 AM. 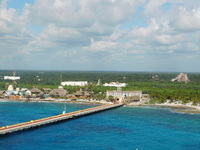 Long pier at Costa Maya - no tram. 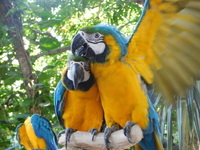 On past Celebrity cruises we were usually onboard by 11 - 11:30 AM. In the past when you received your Sea pass, we would get a number and groups would be called by those #&apos;s. Not this time - they called by cabin class: Suites, Aqua etc. We waited & waited. At 12 noon still computer issues. We did not board until 2 PM. No water, juice or snack provided. Not good for older passengers or anyone with diabetes. Very poorly handled by Celebrity. Our 21 day back to back (B2B) cruise was great. Moses was our cabin steward - best we have ever had. We always get an oceanview cabin. Loved to start our day at Cafe al Bacio with a great cup of coffee. 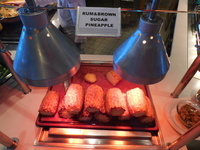 Opus dining room & OV buffet had varied menus. Entertainment was good, not as loud as in the past. Watched the Superbowl in main theater with wings, sliders & hot dogs. 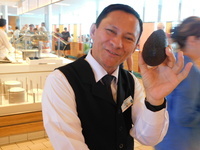 The best part of our cruise is always the staff! We even had an opportunity to talk for a few minutes with the Captain. If I had to list all of our favorite staff - it would be several paragraphs long. Did have an issue with CLA activities. Trivia games were won by a team of passengers doing a B2B, B2B, B2B (63 night total) - a bit unfair! The Sudoku challenges were so tough that twice no one finished in the given time limit. On past Celebrity cruises, you won tickets that could be redeemed for Celebrity bling (T shirts, cards, coffee mugs, beach towels, lanyard etc.) This time, often you were given a Celebrity X metal instead. I gave them back. One last note: we found out several cruises ago that the cabin stewards have 17 cabin to clean twice a day with no assistant. I don&apos;t know about you - but we don&apos;t change our towels and sheets every day. So, we would several times a week give Moses our cabin steward a morning or evening off. We still gave the standard gratuities & also a bonus for a job well done. I wish more passengers would consider doing that also! For disembarkation we did the self walk - off (carry all of your luggage off by yourself) we were off the ship by 7:15 AM and through security, grabbed a taxi to our Hampton hotel in Plantation, FL and were back in our car by 8:30 AM. Ocean View cabin 3122. Cabin had queen bed with 2 small nightstands, TV, safe, refrigerator, small desk with chair, hairdryer in desk drawer, sofa, small table (which we moved to the side of the sofa) plenty of storage (closet, over-bed cupboards & 3 drawers. All of our suitcases fit under the bed. BATH: Shower with glass door, single sink, plenty of storage.